The Devil slinks into the Garden of Good and Evil, cloaked in red, emitting fire, and adding a painful bite to everything he touches. He curls his way around the cedar tree that smells mostly of green freshness with a tinge of damp earthy sweetness, entwines himself around branches carrying lychees and cassis, and breathes a hot red mist of chili all over it. Then, he vanishes in a puff of crimson smoke, leaving fruits that are sweet with a slightly poisoned, synthetic touch. But his crimson present barely lasts, and the evil drains quickly from the Garden of Eden, returning it back to a state of fruited sweetness. It’s an increasingly abstract “goodness,” a fresh blur of fruits that soon takes on a creamy tone with vanilla, before turning into powdered and a little bit sour in their staleness. That’s what happens when you are Playing with the Devil. Blood orange, black currant, white peach, lychee, pepper, pimento [chili pepper], cedar, sandalwood, patchouli, Rose, Jasmine, tonka, benzoin, vanilla. Playing with the Devil opens on my skin a burst of lychee and tart, juicy, zesty, slightly sour blackcurrant. (I’m used to calling it “cassis,” so that’s what I’ll go with from here on out.) There is an unexpected touch of damp earth underlying the scent, which symbolically melts into the very green, leafy images I get from the fruits. 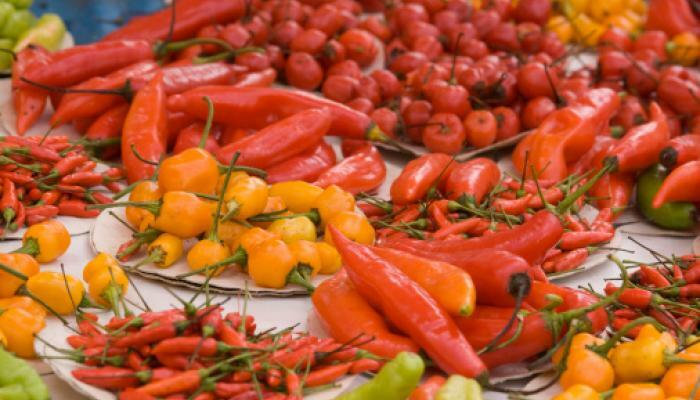 On their trail is a fiery chili pepper (pimento) that feels as visually red as the most brutally piercing Scotch Bonnet or Ghost Chili on the market. It’s a very funky, odd, fascinating note because its bite feels a little like the capsaicin that you’d experience if you nibbled on a pimento pepper. Yet, the second time I tested Playing with the Devil, it was largely overwhelmed by a very fresh, clean scent that sometimes borders a little on the soapy, powdery aroma that you’d get from a deodorant. I actually own a deodorant that has some similarities, so it made me grimace a little, I must confess. 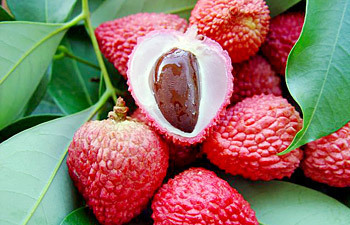 In its opening stage, Playing with the Devil is primarily a lychee and cassis fragrance with that fiery chili pepper bite lurking underneath. Minutes into the fragrance’s development, the peach makes its quiet, very muted debut, feeling white, delicate, pastel and almost liquidy like a thin nectar. It’s followed by a slightly smoky, dry, woody note that initially doesn’t feel like cedar but which soon takes on that tree’s aroma. It smells of bright greenness, mixed with pencil shavings and a light touch of smokiness. The blood orange isn’t a very noticeable note at all on my skin. At best, there is something that feels like the suggestion of its tart, citric nature, but it’s only a vague, fleeting impression. Increasingly, however, Playing with the Devil is dominated by the cassis with its tart, sometimes sour freshness leavened a little by the lychee’s watery sweetness. The note that fascinates me the most is the pimento, a type of chili pepper. I’m rather obsessed with how it appears here, though not always for positive reasons. You see, I tend to have an allergic reaction to the chili peppers where my lips swell up in response to the capsaicin that is so much a part of them. Here, with Playing with the Devil, I feel a slight burning in my throat, a sensation I’ve gotten from some chili peppers on occasion, but also, from some synthetics on a much more common, frequent basis. I find it difficult to believe that Calice Becker used an essential oil derived from chili pepper distillation in Playing with the Devil, so I’m venturing a guess that the pimento note here is largely an aromachemical. Well, congratulations on mirroring the sort of physical reaction that I get from the real thing. On the other hand, a more sincere, genuine congratulations are in order for such a brilliant piece of symbolism. The intellectual conceit or theory here is damn clever, and I absolutely love the thought of the fiery, red-hot pepper representing Satan in the Garden of Eden, thereby turning it smoky and evil. Intellectually, I was impressed with every bit of it. Perfume wise, I find it an extremely interesting, wholly original counterpoint to the lychee and cassis. Personally, however, it’s a whole other matter, because I’m not swooning over any of it. Playing with the Devil is pretty on some levels, and I like the effect of the cedar in adding an increasingly dry counter-point to the fruits, but none of it really wows me. I also enjoy the liquidy sweetness of lychee, but that alone is not enough to make the overall fragrance something that really knocks me to my feet. Moreover, the clean, fresh, slightly soapy, faintly powdered aspects of the beginning are most definitely not me. It’s a pretty opening, but perhaps you have to really adore fruity fragrances to really love it, and I’m afraid I’m not one of those people. At the end of the first hour, Playing with the Devil starts to shift. At first, it’s just the slow stirrings of vanilla in the base, adding a different sort of sweetness to the zesty, tart, slightly green, fresh top notes. At the same time, the fiery, red kick of the chili pepper recedes to the background. There is the vaguest hint of something floral wafting about, but it’s so muted, it’s virtually impossible to really identify. The dry woodiness in the base starts to increase, as does the hint of powderiness. Playing with the Devil’s sillage drops, the notes start to overlap each other, and the fragrance starts to feel a little abstract. These issues were especially noticeable the second time I tested the fragrance, when I put on substantially less of Playing with the Devil. With two small smears, instead of about 4 large ones, the fragrance turned vague and abstract far sooner, became a skin scent more quickly, and the nuances in notes were significantly harder to detect. The capsaicin chili pepper element was also substantially less noticeable, though the burning sensation in my throat remained in a faint way. In both tests, however, Playing with the Devil became a total blur of fruity notes quite quickly. The first time around, with the large dose, it took about 1.25 hours for the fragrance to turn into a generalized, somewhat abstract haze of tart, sweet fruits atop vague woodiness with vanilla. The most you can really single out from the lot is cassis. Underneath, in the base, there is the start of something synthetic lurking about that isn’t clear or distinguishable, along with a touch of fruited patchouli. The peach, and lychee have largely faded away, replaced by hints of blood orange. The chili pepper has disappeared entirely. The whole thing is a soft bouquet of fresh fruits with patchouli, cedar and vanilla that hovers just barely above the skin in an airy, gauzy blur. Playing with the Devil continues its subtle changes. By the end of the second hour, the soft, leafy, green feel of the fragrance is joined by a shadow of a dewy, pale, watery pink rose, but it’s an extremely muted note. As a whole, the scent is a soft, cozy, fruity vanilla with an increasingly synthetic patchouli note that burns my nose when smelled up close. Playing with the Devil loses its dryness as the patchouli overwhelms the cedar, and the fragrance takes on even greater sweetness. For some strange reason, I have the subtle impression and feel of green tea, only in a creamy ice-cream version. It comes and goes, however, during the third hour, then dies completely as Playing with the Devil becomes increasingly fresh and clean. 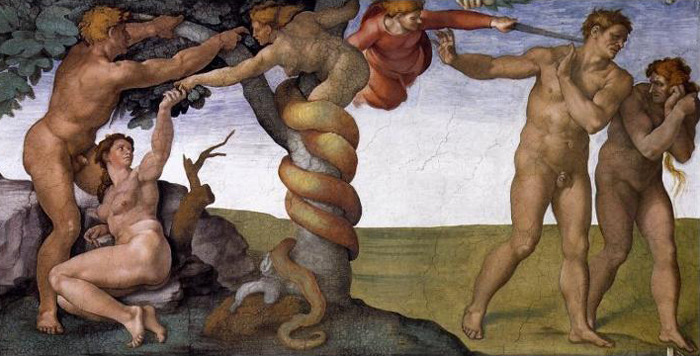 Starting at the fourth hour, the Garden of Eden is a place where all traces of the Devil have been wiped away. The Luckyscent description of Playing with the Devil talks about how naughtiness wins out in the fight between good and evil, but not on my skin. The fragrance is now a completely nebulous haze of clean, fresh sweetness with fruity vanilla and some powder. The latter soon takes over completely. By the 4.5 hour mark, Playing with the Devil is abstract floral-fruity powder with a slight tinge of vanilla underneath. At the 6 hour mark, the powder takes on a slightly sour, stale characteristic, and the fragrance remains that way until its very end. All in all, Playing with the Devil lasted 9.75 hours with a very large dose (4 very big smears) and just over 7.5 hours with a small one (2 small smears). The sillage throughout was moderate to soft. smells exactly like “Enchanted Forest” but the blackcurrant note isnt as loud. if you want loud blackcurrant buy Enchanted Forest. if you want a more softer blackcurrant note buy this. Fresh, peachy, fruity, bright and feminine. If you like fruity (but not sticky sweet) fragrances, you must try Playing with the devil. This is how fruity fragrances should be done. Thumbs up! My experience with The Vagabond Prince‘s The Enchanted Forest was quite different because I had quite a lot of pine develop on my skin, but I do agree with some of the commentator’s assessment: this is a much softer cassis note. I wasn’t a particular fan of The Enchanted Forest, and I’m not of Playing with the Devil, either, and the reasons are somewhat encapsulated in the second Fragrantica review: it’s a fresh, feminine fruit cocktail. Playing with the Devil is also powdery, somewhat synthetic, quickly abstract, and rather boring. If that fiery pimento had really lasted, maybe my reaction would be different, but I highly doubt it. I think you have to really love cassis, and “fresh, clean” scents to appreciate Playing with the Devil. You also have to be one of those people for whom blackcurrant doesn’t turn urinous or into “cat pee” on their skin. You’d be surprised how many people have that problem with the note, so I’d definitely counsel testing Playing with the Devil before you buy it. It’s not a cheap fragrance — and, in my opinion, Playing with the Devil is rather over-priced for what it is — but at least there is a more affordable refill option at $145 if you really love fruit cocktails. I don’t, so I shall play with the Devil elsewhere. Cost & Availability: Playing with the Devil is an eau de parfum that costs $245 for a 50 ml bottle or $145 for a 50 ml refill bottle. The fragrance is not currently listed on the Kilian website, so I don’t know its Euro retail price. In the U.S.: Kilian fragrances are usually available at a variety of fine department stores, but Playing with the Devil seems to be too new to be listed on the websites of either Bergdorf Goodman, or Saks Fifth Avenue. However, you can order it at Aedes or Luckyscent, though both vendors seem to be back-ordered at the time of this post. Outside the U.S.: Playing with the Devil is not yet listed on By Kilian’s international website. In London, Harvey Nichols always carries the Kilian line, but they don’t have Playing with the Devil listed on their website yet. Elsewhere, you can find the Kilian line at Harvey Nichols stores around the world, from Dubai to Hong Kong. In Paris, the Kilian line is carried at Printemps. As for other locations, By Kilian’s Facebook page lists the following retailers and/or locations: “HARVEY NICHOLS (UK, Honk Kong, UAE, Saudi Arabia, Koweit, Turkey), Le BON MARCHE (France), TSUM (Russia), ARTICOLI (Russia) and HOLT RENFREW (Canada).” Samples: you can find Playing with the Devil at Surrender to Chance where prices start at $3.99 for a 1/2 ml vial. This entry was posted in By Kilian, Fruity Florals, Perfume Review and tagged By Kilian, In the Garden of Good and Evil, Kilian devil fragrance, Kilian fragrances, Kilian Playing with the Devil Perfume review, perfume review, Playing with the Devil, Playing with the Devil perfume by Kafkaesque. Bookmark the permalink. With each new by Killian the hopeful side of me wishes for one I will love, but the realistic side of me expects more ho hum. I read black currant and I was hopeful. And fiery pimento raised my hope even more. Then feminine fruit cocktail and my hopes came crashing down to reality. I just am not a fruity fragrance lover in general. So even if this wasn’t by Killian, that description probably would have clinched the deal. This is the very last fragrance that I could imagine you wearing, Cohibadad. In fact, the thought of you reeking of Playing with the Devil has me LMAO! Ug. “Well, congratulations on mirroring the sort of physical reaction that I get from the real thing.” Talk about damning with faint praise! LOL. As for By Killian, I have a *ton* of samples the sales associate at Neiman Marcus (I think it was Neiman Marcus) gave me. Of all the lines to have a million samples of… I know a lot of people like it, but having tried a few, none are really very exciting for me. One of these days I’ll try each sample at least once, but I just can’t get excited about them. This sounds like more of the same from them. At least the packaging is lovely, especially for his travel sizes. Kilian’s packaging is always gorgeous. That seems to be the most consistent praise I can give his fragrances. Some houses just don’t work for me, and I fear his is one of them. I did like Musk Oud, though! Never enough to think it worth actually buying, but it’s the only Kilian perfume thus far that I really enjoyed wearing. The rest leave me feeling various things on the spectrum from underwhelmed ambivalence to deep dislike. *sigh* In short, I fully understand your lack of motivation to test all your samples fully, as well as your lack of enthusiasm. The sales associate just LOADED up an envelope with Killian samples. I think I got two of some. LOL. I think I came out with 12 or so samples. I didn’t have the heart to tell him I didn’t quite share his enthusiasm, but it was a nice gesture regardless – but how I wish he had been repping a brand I like a bit more! I figure I can always swap them or do a giveaway. The only one I distinctly remember trying was the [extraordinarily fleeting] Flower of Immortality. And what I remember was its unappealing sweetness and its short duration. Sigh, indeed. Playing with the Devil sounds almost exactly like a mixture of Kilian’s earlier released Flower of Immortality and Parfums de Rosine Vive la Mariee! I don’t like the bottles of Kilian perfumes, I find the black clutches lovely, the white ones don’t get my sympathy. Anyway I enjoyed reading your review (I was surprised you decided to review it!) but I’m definitely not going to buy a sample and I won’t try to get it in a swap. Only a natural turn of events can make me try this scent! It isn’t your cup of tea either, is it? What do you mean when you say “black clutches”? Has Kilian released something in black clutch-like boxes instead of “coffins”? “Black clutch” and “coffin” are the same thing. It’s just that here in Poland the word we use to name that black box translates into “clutch” best. That white box with golden snake can really work as a clutch, the black box (coffin as you named it) not necessarily although I remember that Kilian showed at his FB page some pictures from the red carpet where some actress used it as a small purse. if you like rich over-ripe (indolicic?) fruit check out pulp by byredo. I’m really not the best person to get Kilian suggestions from, my dear. I’ve tried about 10 or so, which isn’t a vast number and I don’t really respond to the brand very well. I also don’t know how you feel about Oud. You may like Rose Oud, which isn’t very Oud-y, or Amber Oud (which has virtually NO oud in it, no matter what the name may state), but I suspect you’d probably enjoy one of his more floral scents more. And that’s an area I don’t have a huge amount of experience in. The few that I’ve tried, I haven’t liked. Flower of Immortality is okay, but vast numbers of people report extremely short duration with it. (Like 20 minutes, in some cases.) Given that you have longevity issues like I do, I don’t think it would work well on you. As for lavender…… noooooooooooooooooooooooooo! Don’t mention the L-word! 😉 heheheh. I want a miracle: I try this perfume and absolutely love it. Why? Because I want that clutch. And even though I think it’s a fair price for the combination clutch + perfume I still want to like wearing the perfume. In the City of Sin I could probably wear… But I’d love to get a perfume I like more than ITCOS. Black currant leaves me some hope but peach… We’ll see. I have yet to find a Killian to love. I’ve stopped trying. If a sample appears before me I’d try it but I won’t seek it out. That chili pepper note sounds interesting but still not enough to sway me. I keep trying to find one that works for me, but the effort is becoming increasingly half-hearted, I must admit. I can’t see you being wowed by Playing with the Devil, Poodle. Way, way too fruity for you, imo. Nothing from Kilian’s Garden of Good of Evil collection has tempted me as far notes go, but I do like some of the other fragrances in his line including pure oud and love (which I know you’re not a fan of lol). I hate the look bottles though, so I feel like I’m in the opposite boat of most people where I like the fragrances, but hate the packaging hahaha. Great descriptions! So vivid. Love it! Won’t try this particular scent…but I really got a good grasp of the scent from how well you described it. Thanks!